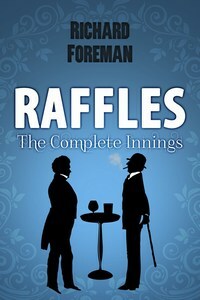 Richard Foreman’s acclaimed series of Raffles stories, which gave life again to the gentleman thief and cricketer, are here collected in one volume, Raffles: The Complete Innings. Full of wit, crimes and romance the books can be read individually, or together they form a story that proves even greater than the sum of its parts. With appearances from Sherlock Holmes, Dr Watson, C. B. Fry and Lord Rosebery, among others, Richard Foreman’s Raffles stories were described by The Spectator magazine as “classy, humorous and surprisingly touching tales of cricket, friendship and crime.” Richard Foreman’s Raffles Series has been widely praised: ‘A capital story! Strong characters, sparkling dialogue, a plot with a twist as the gentleman thief plies his trade again.